Fashion is one of the best ways to help identify someone when looking at historical photographs, but have you ever felt lost when trying to date an image of a male ancestor? Mens’ style can be a bit trickier than women’s fashion to date as trends developed more slowly. Here, dress historian Jayne Shrimpton shares her fashion tips to help you identify your mystery men, from the 1860s to the 1940s. During the 1860s the new loose lounging jacket became fashionable, worn with contrasting trousers. Garments could appear rather shapeless at this time. Date: 1863-4. Image courtesy Jayne Shrimpton. Full-length photographs offer a complete view of men’s fashions. The frock coat seen here was favoured for formal wear, the bow tie one of several 1860s styles. Date: 1865. Image courtesy Simon Martin. In the later 1860s clothes began to slim down. Shorter hair emphasised the neater look and a range of new semi-formal felt hats became fashionable. Date: 1867. Image courtesy Simon Martin. This wealthy gentleman wears the bushy ‘mutton-chop’ whiskers that were especially fashionable in the late-1860s and 1870s. His silk cravat is secured by a pin. Image courtesy Jayne Shrimpton. This working-class man wears the three-piece lounge or business suit that became popular during the 1870s, his watch chain suspended across the waistcoat front. Date: 1870s. Image courtesy Jayne Shrimpton. This older man wears the stately frock coat that was seen as a rather conservative garment by 1880. His narrow beard beneath his chin is one of many styles. Image courtesy Jayne Shrimpton. Dress became exceedingly slender during the 1880s and 1890s, giving rise to the fashionable ‘masher.’ The crowns of bowler hats rose from the mid-1880s onwards. Date: 1890. Image courtesy Jayne Shrimpton. 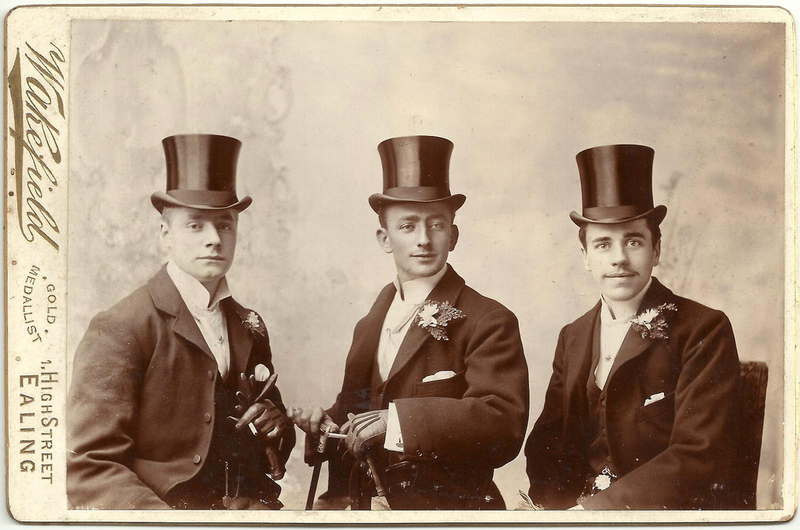 These ushers at a wedding c.1898-1900, look suave in their silk top hats, morning coats, formal white ties and high starched shirt collars, typical of the 1890s. Date: 1898-1900. Image courtesy James Morley. These friends wear three-piece lounge suits typical of the early 1900s, a key detail the small-medium jacket lapels. Note the turned-down starched shirt collars and boater. Date: 1900s. Image courtesy Claire Dulanty. By the 1940s many men wore a sports jacket and wide flannel trousers. Waistcoats were no longer considered obligatory and even ties were discarded for leisure wear. Date: 1940s. Image courtesy Jayne Shrimpton. Want to learn more on how to use fashion to decode your photographs? Read Jayne Shrimpton’s fabulous article in our March-April issue of Inside History magazine, full of great tips and hints for identifying different trends of the time.